Chronic suppurative otitis media (CSOM) is a perforated tympanic membrane with persistent drainage from the middle ear (ie, lasting >6-12 wk). [1, 2] Chronic suppuration can occur with or without cholesteatoma, and the clinical history of both conditions can be very similar. The treatment plan for cholesteatoma always includes tympanomastoid surgery with medical treatment as an adjunct. The middle ear cleft can be thought of as a 6-sided cube. Its lateral boundary, the tympanic membrane, separates it from the outer ear. Its medial boundary is formed by the promontory, which denotes the basal turn of the cochlea. Anteriorly, it is related to the tendon of tensor tympani superiorly and the opening of the eustachian tube inferiorly. Posteriorly, it is related superiorly to the aditus, which connects the middle ear cavity with the mastoid antrum, and inferiorly to the facial ridge. The roof of the middle ear cavity is formed by the tegmen tympani, and the floor of the middle ear cavity lies in close relation to the jugular foramen. (See the image below displaying anatomy of the ear). The anterior and posterior malleolar folds, which originate at the level of the lateral process of the malleus, form the boundary between the epitympanum and mesotympanum, which lie above and below it, respectively. Atticoantral disease predominantly affects the pars flaccida, and tubotympanic disease affects the pars tensa. The middle ear cavity also consists of the ossicular chain (malleus, incus, and stapes). The ossicular chain connects the tympanic membrane, in which the handle of the malleus is embedded, to the oval window, on which sits the footplate of the stapes. In atticoantral disease, the ossicular chain is frequently affected by cholesteatoma, thereby causing hearing loss. Removal of the malleus and or incus may be necessary if they are extensively involved by cholesteatoma. In these cases, a planned second-stage reconstruction is often appropriate. Pseudomonas aeruginosa, Staphylococcus aureus, Proteusspecies, Klebsiella pneumoniae, and diphtheroids are the most common bacteria cultured from chronically draining ears. Anaerobes and fungi may grow concurrently with the aerobes in a symbiotic relationship. The clinical significance of this relationship, although unproven, is theorized to be an increased virulence of the infection. Understanding the microbiology of this disease enables the clinician to create a treatment plan with the greatest efficacy and least morbidity. P aeruginosa is the most commonly recovered organism from the chronically draining ear. Various researchers over the past few decades have recovered pseudomonads from 48-98% of patients with CSOM. P aeruginosa uses pili to attach to necrotic or diseased epithelium of the middle ear. Once attached, the organism produces proteases, lipopolysaccharide, and other enzymes to prevent normal immunologic defense mechanisms from fighting the infection. The ensuing damage from bacterial and inflammatory enzymes creates further damage, necrosis, and, eventually, bone erosion leading to some of the complications of CSOM. Fortunately, in the immunocompetent individual, the infection rarely causes serious complications or disseminated disease. Pseudomonal infections commonly resist macrolides, extended-spectrum penicillins, and first- and second-generation cephalosporins. This can complicate treatment plans, especially in children. S aureus is the second most common organism isolated from chronically diseased middle ears. Reported data estimate infection rates from 15-30% of culture-positive draining ears. The remainder of infections are caused by a large variety of gram-negative organisms. Klebsiella (10-21%) and Proteus (10-15%) species are slightly more common than other gram-negative organisms. Polymicrobial infections are seen in 5-10% of cases, often demonstrating a combination of gram-negative organisms and S aureus. The anaerobes (Bacteroides, Peptostreptococcus, Peptococcus) and fungi (Aspergillus, Candida) complete the spectrum of colonizing organisms responsible for this disease. The anaerobes make up 20-50% of the isolates in CSOM and tend to be associated with cholesteatoma. Fungi have been reported in up to 25% of cases, but their pathogenic contribution to this disease is unclear. The mechanism of infection of the middle ear cleft is postulated to be translocation of bacteria from the external auditory canal through a perforation into the middle ear. Some authors suggest that the pathogenic organisms may enter through reflux of the eustachian tube. The data supporting this theory are inconclusive. Most of the pathogenic bacteria are those common to the external auditory canal. The risk of developing otorrhea (but not necessarily CSOM) through a ventilation tube is reportedly 21-50%. Annually, more than a million tubes are placed in the United States for recurrent otitis media and otitis media with effusion. Studies have reported that 1-3% of patients with ventilation tubes develop this disease. Studies trying to correlate the frequency of the disease with parental education, passive smoke, breastfeeding, socioeconomic status, and the annual number of upper respiratory tract infections are inconclusive. Patients with craniofacial anomalies are special populations at risk for CSOM. Cleft palate, Down syndrome, cri du chat syndrome, choanal atresia, DiGeorge syndrome, cleft lip, and microcephaly are other diagnoses that increase the risk of CSOM, presumably from altered eustachian tube anatomy and function. Certain population subsets are at increased risk for developing CSOM. The Native American and Eskimo populations demonstrate an increased risk of infection. Eight percent of Native Americans and up to 12% of Eskimos are affected by CSOM. The anatomy and function of the eustachian tube play a significant role in this increased risk. 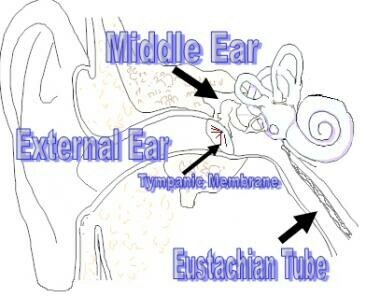 The eustachian tube is wider and more open in these populations than in others, thus placing them at increased risk for nasal reflux of bacteria common to acute otitis media and recurrent acute otitis media and leading to more frequent development of CSOM. Patients with CSOM have a good prognosis with respect to control of infection. The recovery of associated hearing loss varies depending on the cause. Conductive hearing loss can often be partially corrected with surgery. The goal of treatment is to provide the patient a safe ear. Matsuda Y, Kurita T, Ueda Y, Ito S, Nakashima T. Effect of tympanic membrane perforation on middle-ear sound transmission. J Laryngol Otol. 2009 May. 123 Suppl 31:81-9. [Medline]. Wright D, Safranek S. Treatment of otitis media with perforated tympanic membrane. Am Fam Physician. 2009 Apr 15. 79(8):650, 654. [Medline]. Vikram BK, Khaja N, Udayashankar SG, Venkatesha BK, Manjunath D. Clinico-epidemiological study of complicated and uncomplicated chronic suppurative otitis media. J Laryngol Otol. 2008 May. 122(5):442-6. [Medline]. McKenzie W, Brothwell D. Disease in the Ear. Disease in Antiquity. 1967. 464-73. Gregg JB, Steele JP, Holzhueter A. Roentgenographic evaluation of temporal bones from South Dakota Indian burials. American Journal of Physical Anthropology. 1965. 23:51-62. Rathbun TA, Mallin R. Middle ear disease in a prehistoric Iranian population. Bull N Y Acad Med. 1977 Dec. 53(10):901-5. [Medline]. [Full Text]. Wang B, Cheng Y, Xu M. Characterization of the T-cell subpopulations in the granulation tissues of chronic suppurative otitis media. Biomed Rep. 2016 Jun. 4 (6):694-698. [Medline]. [Full Text]. Meyerhoff WL, Kim CS, Paparella MM. Pathology of chronic otitis media. Ann Otol Rhinol Laryngol. 1978 Nov-Dec. 87(6 Pt 1):749-60. [Medline]. Kenna MA. Microbiology of Chronic Suppurative Otitis Media. Ann Otol Rhinol Laryngol. 1988. 97(suppl 131):9-10. Kenna MA. Etiology and Pathogenesis of Chronic Suppurative Otitis Media. Ann Otol Rhinol Laryngol. 1988. 97(Suppl 131):16-17. Bhutta MF, Thornton RB, Kirkham LS, Kerschner JE, Cheeseman MT. Understanding the aetiology and resolution of chronic otitis media from animal and human studies. Dis Model Mech. 2017 Nov 1. 10 (11):1289-1300. [Medline]. [Full Text]. van der Veen EL, Schilder AG, van Heerbeek N, et al. Predictors of chronic suppurative otitis media in children. Arch Otolaryngol Head Neck Surg. 2006 Oct. 132(10):1115-8. [Medline]. Singer AEA, Abdel-Naby Awad OG, El-Kader RMA, Mohamed AR. Risk factors of sensorineural hearing loss in patients with unilateral safe chronic suppurative otitis media. Am J Otolaryngol. 2018 Mar - Apr. 39 (2):88-93. [Medline]. Dobrianskyj FM, Goncalves IR, Tamaoki Y, Mitre EI, Ribeiro FA. Correlation between sensorineural hearing loss and chronic otorrhea. Ear Nose Throat J. 2017 Oct-Nov. 96 (10-11):E43-6. [Medline]. Jensen RG, Koch A, Homoe P. The risk of hearing loss in a population with a high prevalence of chronic suppurative otitis media. Int J Pediatr Otorhinolaryngol. 2013 Sep. 77(9):1530-5. [Medline]. Aarhus L, Tambs K, Kvestad E, et al. Childhood Otitis Media: A Cohort Study With 30-Year Follow-Up of Hearing (The HUNT Study). Ear Hear. 2014 Nov 14. [Medline]. Smith JA, Danner CJ. Complications of chronic otitis media and cholesteatoma. Otolaryngol Clin North Am. 2006 Dec. 39(6):1237-55. [Medline]. Neilan RE, Isaacson B, Kutz JW Jr, Lee KH, Roland PS. Pediatric otogenic lateral sinus thrombosis recanalization. Int J Pediatr Otorhinolaryngol. 2011 Jun. 75(6):850-3. [Medline]. Isaacson B, Mirabal C, Kutz JW Jr, Lee KH, Roland PS. Pediatric otogenic intracranial abscesses. Otolaryngol Head Neck Surg. 2010 Mar. 142(3):434-7. [Medline]. Duarte MJ, Kozin ED, Barshak MB, et al. Otogenic brain abscesses: a systematic review. Laryngoscope Investig Otolaryngol. 2018 Jun. 3 (3):198-208. [Medline]. [Full Text]. Sheikh R, Haidar H, Abdulkarim H, et al. Preoperative Predictors in Chronic Suppurative Otitis Media for Ossicular Chain Discontinuity: A Cross-Sectional Study. Audiol Neurootol. 2016. 21 (4):231-6. [Medline]. Dohar JE. Old and New Ototopical Agents for the Acute and Chronic Draining Ear. Seminars in Otitis Media Management. 1. 1998. 1-14. Dohar JE, Alper CM, Rose EA, Doyle WJ, Casselbrant ML, Kenna MA. Treatment of chronic suppurative otitis media with topical ciprofloxacin. Ann Otol Rhinol Laryngol. 1998 Oct. 107(10 Pt 1):865-71. [Medline]. Dohar JE, Kenna MA, Wadowsky RM. Therapeutic implications in the treatment of aural Pseudomonas infections based on in vitro susceptibility patterns. Arch Otolaryngol Head Neck Surg. 1995 Sep. 121(9):1022-5. [Medline]. Roland PS, Dohar JE, Lanier BJ, Hekkenburg R, Lane EM, Conroy PJ. Topical ciprofloxacin/dexamethasone otic suspension is superior to ofloxacin otic solution in the treatment of granulation tissue in children with acute otitis media with otorrhea through tympanostomy tubes. Otolaryngol Head Neck Surg. 2004 Jun. 130(6):736-41. [Medline]. Consensus Panel, Hannley MT, Dennenny III JC. Use of Ototopical Antibiotics in Treating 3 Common Ear Diseases. Otol Head Neck Surg. 2000. 934-40. Park MK, Nam DW, Byun JY, et al. Differences in Antibiotic Resistance of MRSA Infections in Patients with Various Types of Otitis Media. J Int Adv Otol. 2018 Dec. 14 (3):459-63. [Medline]. [Full Text].